JAKARTA, Aug. 24 (Yonhap) — After capturing the individual sabre gold medal at the 18th Asian Games on Monday, South Korean fencer Gu Bon-gil was in no mood to celebrate, for the victory came against his teammate Oh Sang-uk. But three days later, with the team gold medal over Iran in the bag on Thursday, Gu could finally smile from ear to ear, relieved that he’d kept his promise to Oh. Oh would have received the military service exemption on Monday with the individual gold medal. South Korean male athletes with an Asian Games gold or an Olympic medal of any color enjoy that benefit. And Gu, having already won an Olympic gold in 2012, along with two Asian Games titles in 2014, had little to gain in that sense. Gu said he felt guilty for beating Oh and robbing him of a chance to earn the military exemption. He promised Oh that he would put the team gold medal around Oh’s neck. With that taken care of, Gu said he could finally sleep at night. Gu admitted having to live up to his words affected his performance early on. He looked rather shaky while losing his bout against Ali Pakdaman 7-5. He barely beat Mojtaba Abedini 5-4 to keep South Korea in front by 20-15. Gu said Oh’s strong day on the piste eased some of the burden. Oh led off the match with a 5-1 win over Abedini, and held off Mohammad Rahbarikoyakhi 5-3 in the fifth bout to give South Korea a 25-18 lead. Oh then closed out the match by edging past Pakdaman 5-2 for the final score of 45-32. 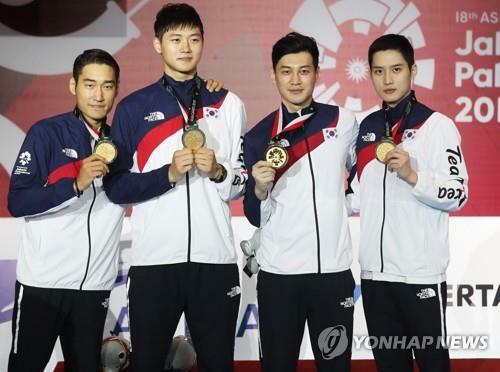 South Korean men’s sabre team is ranked No. 1 in the world. The quartet of Gu, Oh, Kim Jung-hwan and Kim Jun-ho also won the 2018 world title last month in China. Gu and Kim Jung-hwan won the 2012 Olympic gold and 2014 Asian Games gold together. Such a sustained run of success is a rarity in fencing, and Gu said communication has been the key to success. “I can’t speak for other countries, but on our team, communication has never been a problem even though there’s a large age gap,” said Gu, who is 29. The team’s elder statesman, Kim Jung-hwan, is 34, while two young faces, Oh and Kim Jun-ho, are 21 and 24.